Published on behalf of The European Association for Banking and Financial History e.V. Published for The European Association for Banking and Financial History. 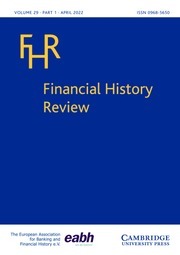 Established in 1994, Financial History Review has earned a solid international reputation as an academic journal committed to research of high scholarly standards. The Review deliberately seeks to embrace a broad approach to financial, banking and monetary history, which appeals to a wide audience of historians, economists and practitioners. We welcome different perspectives including analytical narratives, theoretically-inspired research, advanced empirical analysis, and the interrelations between history, finance, policy, culture and society. FHR publishes research articles dealing with any historical period and country or regional area. The Review, through its section "The Past Mirror", is also an assiduous advocate of the relevance of history for a proper understanding of present financial and monetary developments.